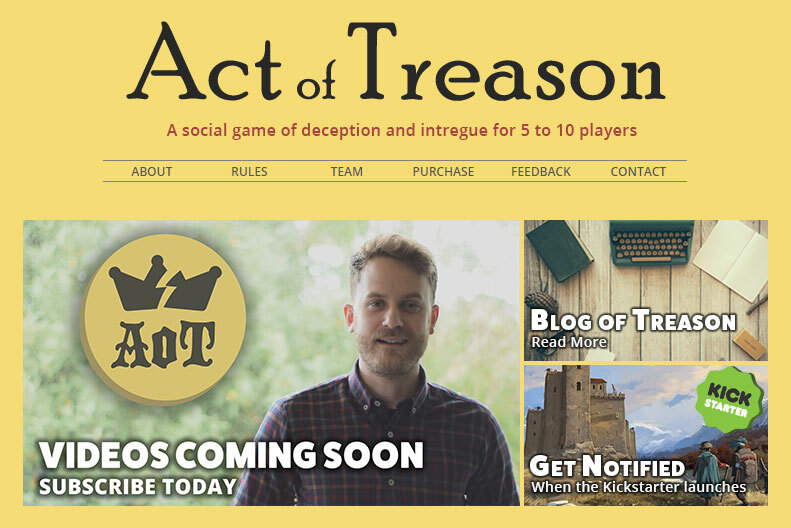 Hi all, just a quick update on how things are progressing with Act of Treason. I won't be sharing too many mechanics with the game this time around as I've not had a chance to try out my latest changes - that'll be in two weeks or so. Once I've tried the new mechanics I'll do a full dissection on what worked, what didn't, and why. But honestly, this week I've just been so focused on getting the groundwork for the promotion going I've not had much time for anything else. Last week has been mostly geared toward prepping for my next play test. The design pieces are done there. The important conceptual work is done, I just need to do the boring labor part of cutting a hundred cards or so and slipping them into sleeves. This week has mostly been devoted to an update of the website, and a few other minor things as well such as cleaning up wordings and the look of various things (cards, website, rules, you name it), and making new promotional art. Now don't get too excited, it's not a total overhaul to the webpage. Ultimately I still love the very minimalist design of my website, so it's just a few minor quality of life enhancements. For example, the 'featured wall' (as seen up above) on the about page will be added. I think the featured wall is important as it provides for a very easy 'hierarchy of information' for a new reader to follow. We don't consciously do this - but we are constantly assessing our surroundings and categorizing the importance of all the information we come across. Things of minor importance we don't track and, things of major importance we do. The number of lights in the room might be of very low importance for example. The number of people might be highest importance, or the nearest exists, or a person of interest. Everything fits somewhere on that spectrum. The featured wall gives the uninitiated a sample of things that indicate that they are of 'high importance'. Otherwise there is just a sea of information and the reader could quickly become frustrated and rightly so if they can't find the information they are looking for. But more importantly, the user isn't shown what is deemed to be important. Why is this necessary? Well without this you're sending the message that effectively all information contained within the site is equally important - which is profoundly not true. You're not providing direction, which can be fairly annoying to a reader who simply wants the answer to a would be simple question "What is this about", or perhaps "Where can I learn more? ", or maybe even "I'm looking to purchase one of these as I have learned enough from else where". These are likely the three most common questions a new website user will have when coming into the website for the first time (I haven't done the research, but, you know, it's likely true or near enough to truth). I can't tell you how many times I've gone to a website with the simple question: "What is this Business, Product, or Brand about?" and the website seems almost intentionally vague. What, where, how, why, when and who should be answered somewhere on your website, not necessarily in that order. All of this is nothing new. Many websites do something similar, flagging important information to the user. It's just fascinating to me as it's a whole new world that I now have to be open to and think about. Oh I also am adding analytics to the site - which I can't believe I didn't add before. I still don't know what I'm doing with it all too well. But at least so far I have managed to get some rudimentary analytics and reports running with it. 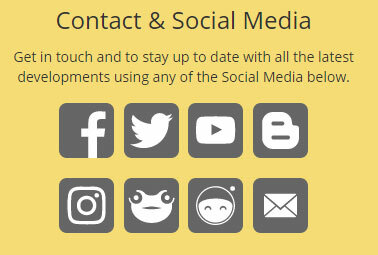 So will hopefully be able to expand on that in the coming weeks and get up to speed with it before I start rolling out the serious advertising. 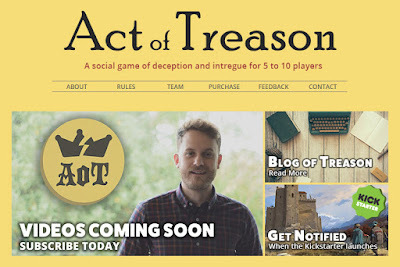 I have to say things have really begun to progress rapidly with Act of treason, and it's really hard to pin point exactly why. I think there are actually multiple factors that have all culminated into giving my the motivational groundwork to push off from. I think Jordan B Peterson with his Self Actualizing Suit really helped - you can learn more about him in the op-ed I will be releasing asap. I think my exercise regime really helps. I think having just a little bit of extra time away from work really helps. And I think the added weight of responsibility helps - having responsibility for others who rely on you really does change the dynamic of the situation. Altruism kicks in and you're not just in it for you anymore, you're in it for those you love and those whom you want to support. This is one reason why married people tend to earn more and be more prosperous - they likely have more children, and thus more responsibility. Anyway that's enough for today. Thank you for reading and see you next time.